Delicate lanterns made from pleated paper and table lamps that display assorted objects are among Dezeen editor Amy Frearson's highlights from lighting fair Euroluce in Milan. Forming part of the Salone del Mobile, the biggest event at Milan design week, Euroluce showcases lighting from 450 different brands, including Lasvit, Flos, Ingo Maurer and Roll & Hill. Designers presenting new products this year include Nendo, Formafantasmaand Yabu Pushelberg. Nearly two decades after launching his Mamo Nouchies, a series of lights made from pleated Japanese paper, German designer Ingo Maurer has created a variety of new shapes. Among them is Moonati, a wall light with a shell-like shape, and Yoruba Rose, the table version. A flattened power cord forms a sculptural support for this wall light – one of two that Italian duo Formafantasma has designed for Italian brand Flos. Soft illumination comes from the central LED ring. Known for his clean lines and classic shapes, London-based Michael Anastassiadeshas added three sculptural designs to his Mobile Chandelier series. This is the most impressive of the three, combining horizontal lines with semicircles. Although this light was actually launched by Lasvit in late 2016, it makes its Milan debut this year. Developed by Slovakian designer Boris Klimek, it comprises colourful glass slabs that resemble boiled sweets. Another highlight from Ingo Maurer's stand, this versatile light is encased within an inflatable tube. It can be suspended, hung, leaned or simply placed on the floor, and has an integrated sensor for a switch. These simple pendant lights look like they they are wearing hats – some pointed and some circular. A collaboration between designers Jonah Takagi and Hallgeir Homstvedt, they are available from Roll & Hill in black, brushed brass, oil-rubbed bronze or polished nickel. North American design duo Yabu Pushelberg worked with hand-blown crystal to create these lights for Lasvit. Each piece is decorated with slender lines and connected by polished golden links. Two linear lights overlap to form this cross-shaped pendant light, created by Swiss designer Guillaume Sasseville. 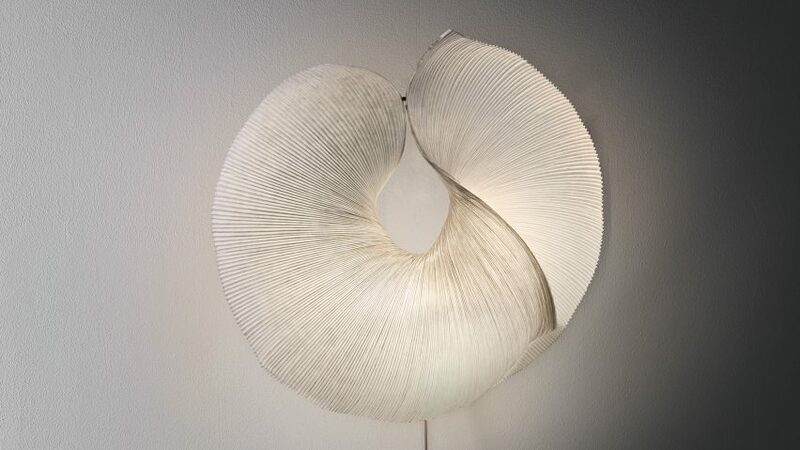 It is described by Lambert & Fils as "part art installation and part utilitarian light". Another highlight from the Flos stand, these box-shaped lights are used in combination with other objects to create framed scenes. Designed by Japanese studio Nendo, they can be paired with bowls, vases, a mirror and more. Modelled on acrobats' hoops, these brass lights link together. Designed by the in-house design team at New Zealand brand Resident, each hoop is surrounded by LED lighting. More circus-inspired lighting can be spotted at the Flos stand, where Michael Anastassiades has created a similar effect with different shapes.